Special offer ! - Buy 2 (12) packs and get 1 (12)pack free ! Thats only .66 cents per station! 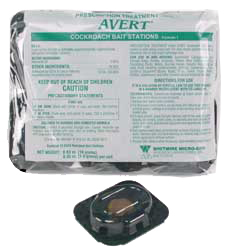 These bait stations should be placed into or near cockroach harborage sites for best results. You can and should use this in or by: Apartments, campgrounds, food storage areas, homes, hospitals, hotels, meat packing and food processing plants, motels, nursing homes, resorts, restaurants and other food handling establishments, schools, supermarkets, transportation equipment (buses, boats, ships, trains, trucks, planes), utilities, warehouses, and other commercial and industrial buildings. under and around equipment and appliances, counters, etc. Replace when empty or every 3 months, whichever comes first. 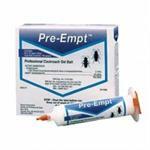 Avermectin is classified as a green pest control product! Would you like to see the Avert Cockroach Stations Label?